A unique countertop makes any kitchen more attractive. The same goes for restaurants, where a good countertop can change the ambiance depending on the kind of vibe the owner wants to establish. Dark finishes can give the restaurant a warm, cozy feel, whereas bright-colored countertops give energy and personality to the entire room. One of the best materials to use when designing a countertop is concrete. 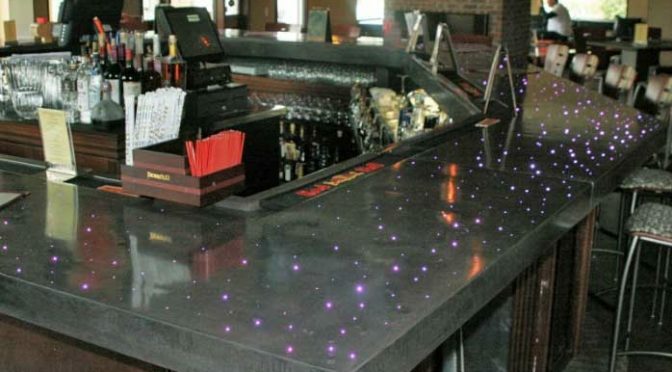 Its versatility makes it the perfect choice for customized countertop designs, and the endless options and finishes of decorative concrete will guarantee that your restaurant will look one of a kind. Certain characteristics of restaurant countertops depart from usual countertop designs and finishes. While home kitchens may opt for a textured look, like wood-formed islands, restaurants should go for a smooth, polished look to make the surface easy to clean, given the amount of plate traffic the countertop has to endure every day. Another feature used is a glossy finish that reflects the ambient light, which gives the countertop a warm gleam. A unique touch can be added through personalized logos embedded in the concrete or fiber-optic lighting added into the design. A good restaurant concrete countertop design does not only focus on the aesthetic, but also on longevity. A good sealer should always be used on restaurant countertops, because the amount of spills anticipated is much more than that of a regular home countertop. The sealer should also be tough and resist any staining that may occur with food and liquid messes. JM Lifestyles provides concrete countertop design and installation services. We will assist you with concept planning, design making, and countertop finishing, making sure you have the perfect countertop for your restaurant. If you want to go for a natural feel, we can make hand-carved concrete rock islands and countertops that can transform any space into the ultimate rustic dream.